Some books capture your attention. 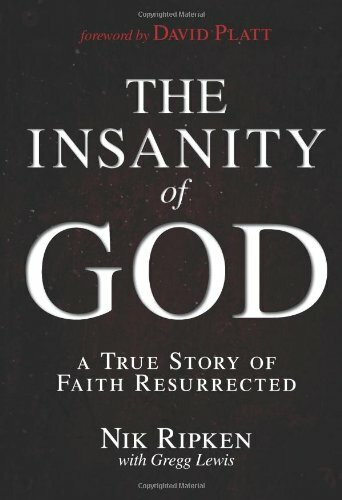 After several recommendations, participating in a couple interviews with the author (links below), and hearing the title, The Insanity of God, over and over again my curiosity was peaked and my attention was captured. The title may seem a little ostentatious, but Nik Ripken is wrestling with the very way in which God works in the world. After several years as a missionary in Africa, and after a particularly difficult stint in Somalia, Ripken found himself questioning the power of the Gospel to make a difference in this world. Can the Gospel actually make a difference in places of immense suffering? Can the Gospel survive and even spread under intense persecution? Is Jesus worth it? Ripken wrestles through his questions as he begins a journey around the world to study the growth of faith in the midst of persecution. What he finds is a flourishing movement of believers that boldly believe and share the Gospel while facing the direst of circumstances and consequences. These believers have found true life in Christ. If you are wrestling with similar questions to Ripken, this is a great book to read. After some introductory material, the book is a collection of stories of faith from around the world as Nik experienced them first hand. The book is broken up into thirty-four short chapters around ten pages each. I suggest reading this book devotionally alongside your regular Bible reading. I read two chapters a day after my devotion and deeply considered the implications from Ripken’s experiences and stories of faith amidst persecution. I found Ripken’s book to deeply motivating to engage in God’s mission to bring the Gospel to the nations. Though motivating, Ripken’s book uses clichéd Christian terms at times (even trademarking one! ), and can be a little cheeky in its presentation, but don’t miss the message. God is working out his plan of salvation for the world today and there is power in the Gospel to have a flourishing, empowered faith even under the cover of the darkest suffering and persecution. Furthermore, Ripken’s theology will vary from that of some readers, but again don’t miss the point, the Gospel is flourishing and we need to jump in with both feet finding power in the resurrection. 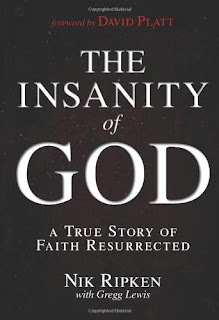 If you want to be motivated to share the Gospel, if you want to be convicted of a lethargic faith, if you want to wrestle with the seeming insanity of God’s plan to advance and grow the Gospel in the midst of persecution, I highly recommend this book. This is a great book to jumpstart your heart in the area of evangelism and daily living for God no matter what comes your way. You too can participate in the insanity of God every day when you set foot out into our world with the Gospel in your heart and on the tip of your tongue for those in need of salvation. I have also included links below to the interviews that Bryan Catherman, Brett Ricley, and I conducted with Nik Ripken on our podcast Salty Believer Unscripted.